We review the Alien Artifacts: Discovery expansion for the Alien Artifacts card game published by Portal Games. This small expansions adds a pile of new cards to your Alien Artifacts experience and we let you know if it's worth it. 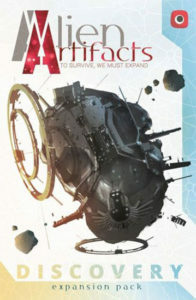 If you read my review of Alien Artifacts, you know that I really enjoyed it. 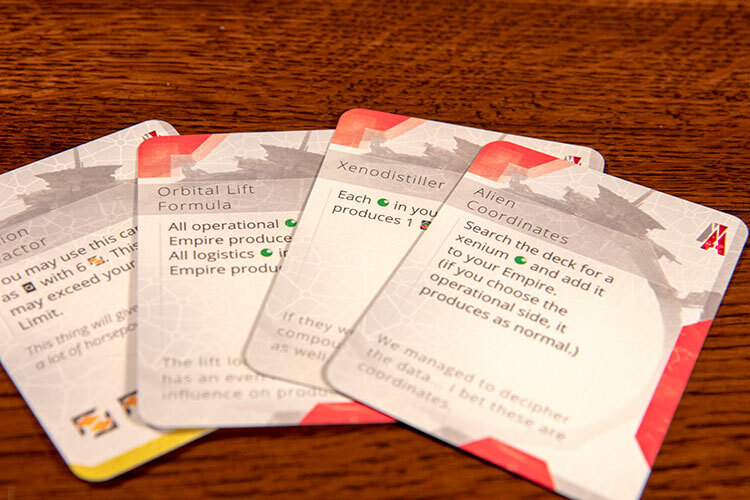 Alien Artifacts is a card game that is based on expert play of multiuse cards and has, in my opinion, high replay value, both of which are characteristics that I love in my games. If you are a fan of Portal Games, you know that they have a history of publishing multiple expansions for their successful games (51st State, Imperial Settlers). Unsurprisingly, Portal has released the expansion Alien Artifacts: Discovery (AA:D going forward). Yay!! The biggest addition is the new card type, Alien Resource. This is the only new mechanic added to the game by this expansion. The rest of the cards can be shuffled into their corresponding decks from the base game. 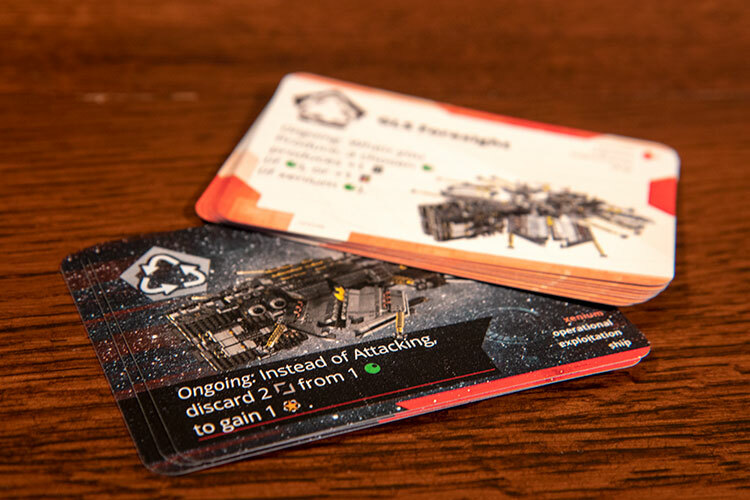 Each Alien Resource card has an alien resource symbol at the top of the card and a production bonus at the bottom. Alien Resource cards are drawn when a Planet that has the alien resource symbol is either exploited or it produced (note: all 10 Planet cards in this expansion have this symbol). The expansion comes with new cards in each of the 3 different types. I really liked Alien Artifacts, so I was excited to add the new cards to my base game. I was not disappointed. My favorite addition is the Alien Resource cards. These cards present two new options for players. First, when it is produced, it provides an immediate one-time bonus, ranging from gaining more credits to activating an operational ship. Second, the card is tucked under the planet with the alien resource showing. So, what is so cool about the alien resource? Like the gold symbol from the base game, it is a universal resource; however, unlike the gold symbol, it can be used for any action, not just basic actions. That being said, the alien resource is still subject to the Assembly limit. 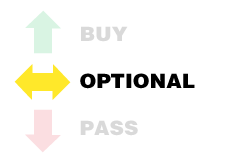 I liked this new mechanic because it provides a new way to pay for actions outside of the basic actions. The new ship cards provide a quick way to earn a victory point. I also liked how simple it is to add AA: D to your game. Create the new alien resource deck, shuffle the remaining cards into their respective decks and go. It is great! Plus, this expansion does not lengthen the time to play the game, which is an unwanted side effect that often happens when adding expansions to games. • Logistic technologies provide unique ongoing bonuses tied to alien resources. Much like in the core game, the Artifact cards can be somewhat hit or miss. I found two weaknesses with the expansion. Similar to the base game, the new alien artifacts are hit or miss and can be very situational. This is not that big of a deal because I have always viewed the artifacts as a gamble. What I did have an issue with was the fact that no new alien system cards included in the expansion. You are still stuck with the same five from the base game. These can get very repetitive, which is even more alarming in a game that provides replay value in every other aspect of the game. Hopefully this will be addressed in future expansions. Yes, I do want more expansions! I enjoyed Alien Artifacts: Discovery and would not hesitate to recommend it to anyone who enjoyed the base game and is looking to expand their card pool. I loved that it was easy to add to the game and that game length did not increase. I also liked the new Alien Resource cards. Unfortunately, if you did not like Alien Artifacts, I cannot recommend Discovery because it will not change your opinion of the game. It is more of the same. 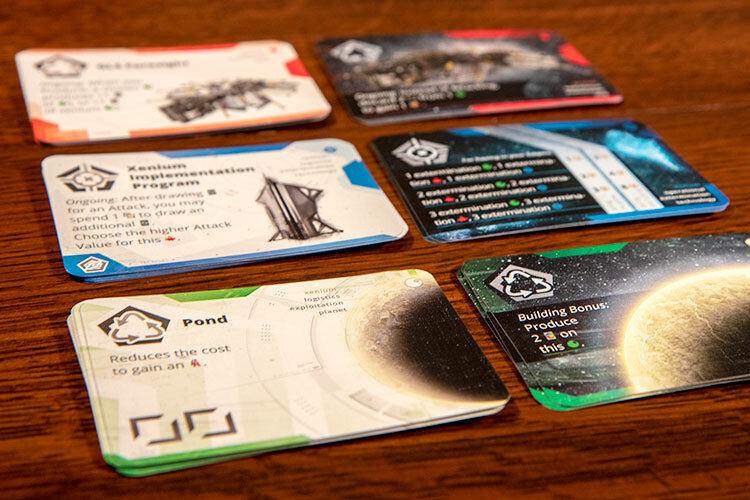 I also felt that Portal missed the opportunity to add Alien System cards to expansion, one of the few issues that I had with the base game.